Larry Gene Peltier, 42, of Onalaska, was arrested for suspicion of boating while intoxicated. Boating While Intoxicated on Lake Livingston, BLANCHARD, August 2, 2008 - If you drink, don't boat. If you boat, don't drink. In the eyes of the law, boating while intoxicated is just as serious as driving a car while intoxicated. If you get caught, you're busted. 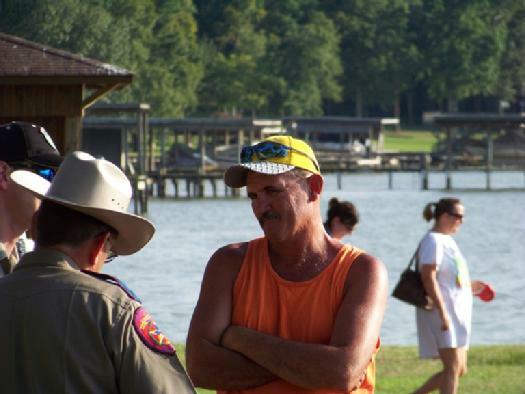 Shortly after 6 pm on August 2, 2008, Game Warden Ryan Hall, in a routine boat stop, stopped a pontoon boat being driven by Larry Gene Peltier, 42, of Onalaska. Warden Hall sensed that Peltier was intoxicated. Peltier was brought to shore at Blanchard Park. Once ashore, Hall summoned DPS Trooper Darwon Evans. DPS units are equipped with dashboard cameras for video taping field sobriety tests. A field sobriety test was administered and Peltier failed. Further, according to Hall, a breathalyzer was administered and Peltier blew 2 1/2 times the legal limit. Peltier was loaded into trooper Evans' unit and driven to Polk County Jail and booked in for suspicion of boating while intoxicated. Peltier's boat was picked up and taken home by family members.